Spring was full of reading disappointments. Either the book I chose had a stupid plot. Or characters I couldn’t access. Mystifying edits. Writing that made me feel I wasn’t in very capable authorial hands. By May I had begun to despair. I used to read every book to the bitter end, the least I felt I could do to honor a writer’s hard-won journey to publication. I don’t do that anymore – there’s too much great literature to read, too many bad books out there, and too little time. Now I give a narrative 50 pages, and if it’s not working for me, I put it down. It’s possible my problem this spring was mostly reader error, what with packing and being distracted, but I don’t think so. Summer’s surprising, random, unexpected reading list broke several months of stories that failed to delight. One thing I love best about these reads is the way they came to me. While I waited for my latte at the coffee shop, I looked through the “TAKE ME” bookshelf and found a tome about two centuries of opportunists exploiting the natural resources of the Channel Islands off the coast of California. The promise of a couple generations of depletion from sheep ranching, a shipwreck that introduced rats to Anacapa, and one very passionate National Park Service conservationist Alma Takesue from the 21st century who wants to eradicate the rats on Anacapa to save a species of shore bird, made me take the novel home. Always rich and believable, Boyle’s female characters tussle with the natural world and with their lovers. Boyle is masterful at storytelling with a wide lens on generations and place, but he’s also good at the intimate landscaping that captures the dark forest, as Willa Cather calls it, of the human heart. 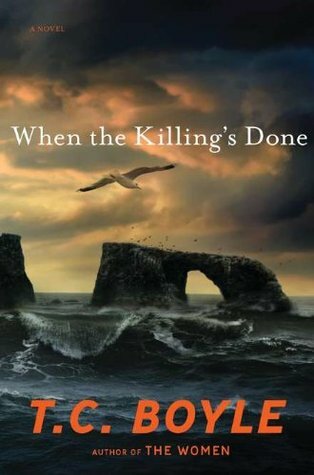 And while When the Killing’s Done is far from one of Boyle’s best works – even full as it is of shipwrecks, the sticky wicket of conserving species and how conservation is inextricably linked with destruction, and a very one-dimensional PETA-esque bad guy called Dave LaJoy who gets what’s coming to him on the heels of an act of revenge – in all ways that mattered most to me this summer, it was the perfect read at the right time because I was transported out of my world. I had T.C. on the brain already. In the city on my way somewhere else, I walked by a garden shop wheelbarrow and out of the corner of my eye caught the name Boyle. For $2 (sorry, T.C. 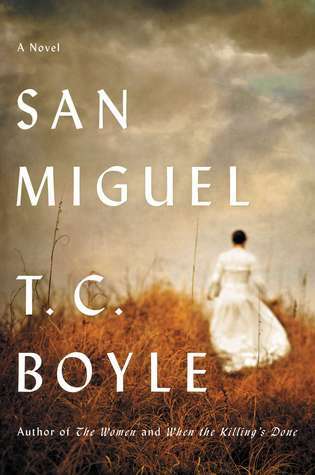 ), I picked up Boyle’s San Miguel, set again in the Channel Islands. It’s another sheep island story, on a different island this time, and most of it set in the 19th century. But in both When the Killing’s Done and San Miguel (published less than a year apart), Boyle is scratching an itch about generations of people discovering, exploiting, preserving, and resurrecting the natural resources of the Channel Islands, and the human drama behind such ambitions. Both books are gritty romances, rife with relationships built upon punishment and power, lust and willful misunderstanding. He’s fantastic at this emotional geography, map-making a world of tortured souls who often don’t know what they want, or worse, they do know, and their sometimes terrible desires become the gears of the story. I get it. An island is an interesting Petri dish for storytelling, with an ecosystem you can manipulate and experiment with, not to mention the outside world sailing over to disrupt the narrative. I couldn’t put it down, because how could you not careen off the tracks with such characters as these? 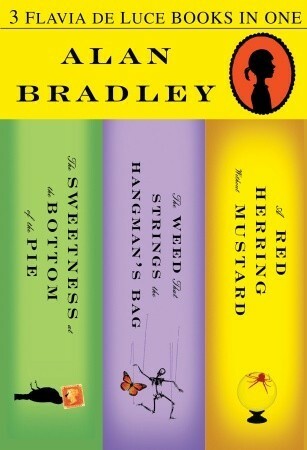 Alan Bradley’s The Sweetness at the Bottom of the Pie. This book had been on my bookshelf for several months, and I’d purposefully avoided it because of the cover, spring green with a bird and stamp on it that screamed of some saccharine story about women finding epistolary love. While packing, I left out books from my collection that seemed like good summer reads. Most of them were mysteries. Another look at the synopsis of Bradley’s book piqued my interest, so it made the cut. It took me almost the whole first book to realize that though Bradley’s narrator is a precocious, naughty and very determined eleven-year-old Flavia de Luce, the book isn’t really Young Adult, though on the surface it seems to be. I liked the book so well I did a quick search to see what else Bradley has written and was gifted with the knowledge that there are FIVE Flavia de Luce books. Oh boy. I checked out the next three from the library, in LARGE PRINT, because those were the only versions they had. And I was desperate. In each of the books, set in the 1950s English countryside, Flavia works to solve a murder. A crackpot chemist with her own chemistry lab in the abandoned wing of their ancestral English home, Flavia comes at problem-solving through science; in fact, a reader can learn a thing or two about chemistry from her. But some of the best scenes are born out of the passages where we see Flavia acting as a child – mourning the death of her mother, plotting revenge against her two older sisters, looking for a way to talk with her father, who is wracked by grief and who deals with the imminent crisis of bankruptcy by losing himself in his stamp collecting. The cast of characters flanking Flavia is, of course, also delicious – Dogger, her father’s valet, gardener, butler, and right-hand man, and also Flavia’s closest ally; Inspector Hewitt and his wife Antigone, whom Flavia half longs to be adopted by; her bike, Gladys, which used to be her mother’s and which ferries her to crime scenes and various investigations; and in each book, the characters who come through to people the world of the crime. It’s delicious fiction – witty, smart, backlit by clever capers for which you can suspend disbelief — and the first time I’ve fallen for any books from the mystery section. Bradley’s got another installment in the wings, Book Six, due out January 2014, and I’ll wait, mostly patiently, to continue the saga. Also, there’s going to be a television series. Oh dear. Mixed feelings. 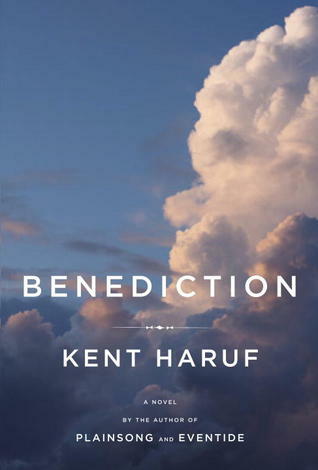 Kent Haruf’s Benediction. A master at impaling his characters on the prongs of their foibles and choices, Haruf’s stories teem with regret and redemption. His characters labor under the aftermath of failing to act, or emotionally sealing themselves against the world, and the reckoning that comes as a result of hiding from themselves. His latest, Benediction, is again set in Holt, Colorado. It’s more ambitious in some ways than his previous novels, in that it braids the lives of five or six sets of characters. At the center of the narrative are Reverend Lyle, a newcomer from Denver who’s been transferred to Holt for some transgression we can only guess at, and Dad Lewis, dying of cancer, owner of the town’s hardware store, father of two children — one estranged son and one daughter who’s come back to care for him as he’s dying. Writers are generally advised not to scaffold a story around cancer, a character dying from cancer, so I was skeptical such a seasoned writer would take this plunge. But the presence of Lyle, a man of God, works to offset Dad’s life of harsh mistakes and complicates one of Haruf’s central questions about what it means to live an upright life. Readers know, of course, that Dad Lewis is going to die from cancer. Haruf establishes this on the first page. We know his wife Mary is there to take care of him, that he’s agitated by regret. While he waits to die, we see Dad’s life in flashback, which is to say we are transported to times for which Dad feels he must make amends – the firing of an employee and that man’s ultimate suicide, the way Dad alienated his son Frank. The big question pulling a reader through the narrative is whether and how Dad’s going to see Frank again before he dies. Except through morphined hallucinations, he never does see his son again, which is inevitable and heartbreaking and earned. Dad’s absentee and sometimes harsh parenting and his tender care of others instead of his own family have brought him to this place of being alienated from his son, and it hurts like hell. Readers also know that Reverend Lyle will do something to alter his path — he must have agency where Dad can only recollect his version of it from his deathbed, after all – but we don’t understand why Lyle doesn’t have a better relationship with his son, and what makes him fall away from the church, though it seems admirable enough after a life of passivity. Still, I’m not sure he’s working to his potential as a character. The heart of the story, then, is the disconnect between fathers and sons, the bond between mothers and daughters (Haruf has an affinity for stoic women; Benediction is rich in pairs of two generations of women holding what crumbles together), and the way, as in all of Haruf’s work, people quilt family out of the dust of loss and need. I’ll forgive Haruf for the left turn at the end and its half-hitched deus ex machina with Alice and her bike, since I can see he was grappling with how to deliver the point home. I was already crying my eyes out about Dad’s death, about Reverend Lyle’s inability to make a relationship with his son, even there in that dark garage. We have to work for grace however we can, but there’s never enough time, which I guess is largely the point. Now, almost at the end of January, I have resolve still in the tank, though the guitar has been swapped out for a ukulele. I’m awful at it. I watch You-Tube videos to keep myself motivated. Maybe by spring I’ll be able to strum something that sounds like a song. I’m trying not to spend too much time looking ahead, but it’s dark and cold and gray. Blessedly, the days are getting longer. 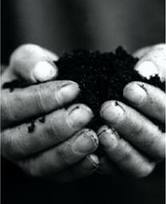 It’s time to start mapping out the garden, order seeds, and calculate what my soil will grow. With spring in the wings, it’s a little hard to practice living centered in the now, especially when a whole lot of the now, honestly, is pretty painful. Having to explain to my kids why friends lose their jobs, or get cancer, or decide to divorce, what the hell the deal is with Twitter, or why bullies have such power, or why there are all those empty desks in Connecticut, leaves me feeling inadequate to the task. 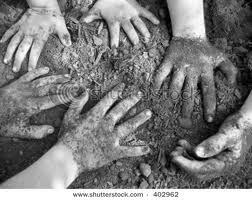 We must learn to rub along with people of all kinds, I say to them. Some relationships are for business, others are toxic and teach you about boundaries and knowing yourself. Some relationships are for friendship, some are for love, some fall away. It’s all part of the deal, I tell them. Our job is to acknowledge that we can’t control other people or their responses to the world, we can only be in charge of ourselves. But they’re kids; they think I’m not hearing them well enough. They want life to be decipherable, literal, with rules they can anticipate and apply. I try, always, to end these hard conversations with what we are grateful for –the winter wren; books and chocolate; our chickens, who press themselves in a heap against the glass of the slider doors, asking to come inside and be with us when it’s cold; the woods; the tangle of people we hold dear in our lives, for whom we have fierce love. But some days, when the world feels bleak, and when my advice is cold comfort for kids working to make sense of the world, digging for gratitude is damn hard. Before the new year a poem by Max Coots arrived in the mail from a friend. Max is someone I’d never heard of, but his words — grounded, grateful, funny– made me want to invite him over for dinner or a glass of wine. I asked Uncle Google about him and discovered he died in 2009 after a long, rich life as a Renaissance Man. A Unitarian Universalist minister, a sculptor of gargoyles (this, alone, is enough to make me half fall in love with him), a poet, and a gardener, Reverend Max was the kind of guy who spent his life working to embody my resolutions. Maybe not the ukulele or the ten minutes of core, but it seems to me he was the kind of spirit I aim to be. harvested, but who fed us in their times that we might live. Often, when I decide to write a story or plant a garden and turn inspiration into artifact, I think about Dominic Gospodor. He’s not my muse exactly. And he’s not related to me. In fact, I’ve never met him. 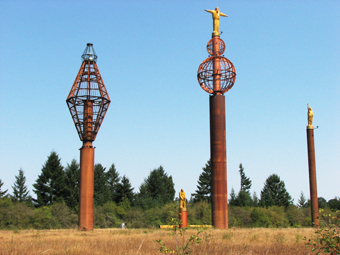 An eccentric millionaire devoted to creating sculptures in honor of the oppressed or forgotten, Gospodor is maybe best known for Gospodor’s Monument, his field of strange art along I-5. He built it despite criticism for his art form, sure to be an eyesore, and for creating a potential traffic hazard. From the beginning, people haven’t been able to help themselves when they drive by. They slow down. They veer. They take pictures, sometimes while still driving. The place lights up at night. It’s fantastically bizarre. I’m not sure I’d want one of Gospodor’s pieces in my own field. But for me, his sculptures serve as a reminder of how mysterious and passionate an engine the journey from inspiration to creation is. He spent close to a million dollars to bring to life three 20-foot gold-painted wooden sculptures atop copper-colored steel towers (the highest one is 100-feet). The sculptures pay homage to Native Americans, Mother Teresa and victims of the Holocaust. There’s also what Gospodor claimed to be the world’s largest weather vane with its giant Alaskan flag paying tribute to William H. Seward, the Secretary of State who bought Alaska from Russia in 1867. Gospodor had big plans for more creations to honor victims of drunk driving and slavery, as well as smaller monuments for Susan B. Anthony and Jonas Salk, but he died before those could be realized. I’m a big fan of any Roadside America attraction, but Gospodor’s field, one I drive by a few times a year, has a special place in my heart. When he died in 2010 at 86, he gave what money he had left to the homeless and the poor, so the question of stewardship of his unusual monument has been up in the air until recently. A few weeks ago, the Cowlitz Indian Tribe agreed to oversee the land and work to preserve it as a cultural and historical site. I’ll never get the chance to meet Gospodor, but I’m grateful his art will stay alive in the world, odd as it is. We should all be so lucky to create outside the din of mainstream expectations. So thanks, Gospodor, wherever you are.